With one of the best research and development structures in Latin America, the State of São Paulo has attracted many companies due to the increasing importance of innovation as a decisive advantage in the global market. Among the factors that explain this attraction, we highlight the presence of reputable universities that combine high-quality higher education, research centers and laboratories of international recognition, with outstanding production in many areas of knowledge. According to the São Paulo Research Foundation (Fapesp), the sector of research and development of the state is driven by companies that invested, in 2010, approximately US$ 6.8 billion in internal research and development (R&D) activities. Out of the US$ 2.5 billion invested by the set of Brazilian states in the sector in 2010, the state universities of São Paulo accounted for nearly US$ 2.2 billion, or 86% of the total. In 2013, has been announced an additional US$ 790 million in the creation of 17 research centers, funded by the universities of São Paulo and Fapesp, which is responsible for promoting research, exchange and the dissemination of science and technology produced in São Paulo. The University of São Paulo (USP) is the Latin American institution best ranked in international quality rankings and alone it accounted for nearly half of all funds invested in R&D in state university systems, according to indicators from the Ministry of Science Technology and Innovation (MCTI). In total, US$ 1.2 billion was invested in 2010. On the other hand, the Universidade de Campinas (Unicamp) reached US$ 570 million, while Universidade Estadual Paulista (Unesp) received US$ 374 million. The School of Medicine of São José do Rio Preto appears on the table of MCTI with US$ 4.4 million invested in 2010. The methodology adopted by the MCTI covers the expenses with postgraduate courses, an activity of universities identified with research. Approximately 10% of Tax on Goods and Services (ICMS) levied in the State of São Paulo is allocated to these three institutions, which have the autonomy to manage their resources. Among the initiatives intended for innovation, science and technology in the state, it is worth highlighting the System of Technology Parks of São Paulo (SPTec), created by the Department of Economic Development, Science, Technology and Innovation (SDECTI), with the purpose of promoting economic and technological development in various regions, by attracting investments and generating new knowledge-intensive companies. Why invest in Research and Development in São Paulo? The State concentrates the best structure of the sector in Latin America. 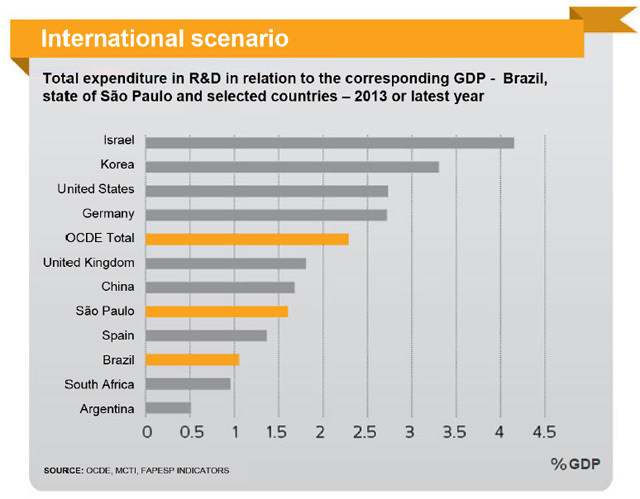 It invests 86% of the Brazil's total in R&D. São Paulo houses federal, state and local public universities. and best university in Latin America. The State offers an intensive network of incubators and technology parks. Click here to download a brochure with more information about the sector. We invite you to find out why São Paulo is the right choice for your business. Investe SP is always ready to assist you promptly, efficiently, and free of charge. Learn how the Paulista Agency of Investment Promotion can help assess your project by clicking on Services or contact our team on Contact Us.